For those of us who live in Southern California, news releases about the devastation in places like Japan and New Zealand send alarm signals to our brains. As we watch people dig through the rubble, and wander the streets, we worry about what will happen here when the next "Big One" hits. In fact, seismologists seem to come out with a new pronouncement every few months that we are long past due for another major earthquake. However, California is not the only vulnerable area. Recently, tremblers have hit in Japan, Washington, and even midwestern states like Oklahoma. Are you prepared if an earthquake hits in your area? Despite all of these warnings, or perhaps because there are so many of them, California residents are aware that earthquakes actually occur without any real warning. Although we may be told that an earthquake could happen in the next 10 or 20 years, that is not the same as being told with absolute certainty that one is going to happen this week. Unlike other natural disasters such as hurricanes, people are not given even a few minutes notice. Therefore, we need to learn how to prepare for an earthquake, even when we do not know when it might strike. Link to Pre-Assembled Disaster Kits from Amazon. One advantage of watching the news covers of earthquakes and similar disasters is that it makes you aware of the problem with expecting to be saved by someone else immediately after the disaster strikes. In the event of a major earthquake, it could be a day or two (or even longer) before the police, fire department and other rescue personnel would be able to reach you. Until then, you will have to be responsible for taking care of your immediate needs. In order to do this, you need to have an earthquake kit or two. Basic toiletries, including such as toothbrushes, toothpaste, deodorant, sample bottles of shampoo, etc. You need to change out the water, medications and canned food about every six months, and check the batteries, as well. In fact, it would probably be a good idea to open and air out your emergency kits from time to time. A list of important phone numbers for relatives, doctors, etc. A small, locked box containing copies of your drivers' licenses, passports, birth certificates, social security cards, insurance cards, insurance policies, bank information and credit card information. Think about where you should keep your earthquake kit. You may want to have a small one with a few essentials in each of your cars, and keep a large one at home. However, many people store their emergency supplies under the bed. 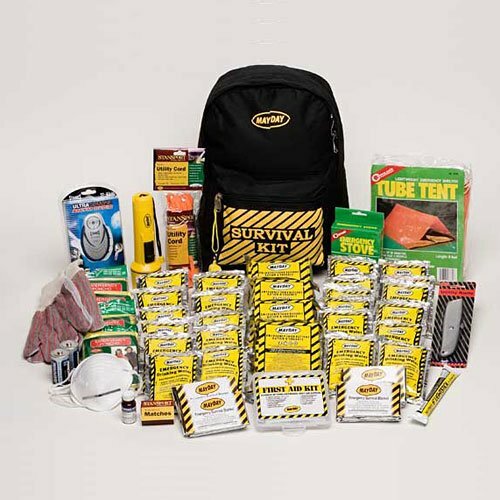 Unless you are convinced that you would have no trouble retrieving it from under a bed in an emergency, many people are choosing to keep their earthquake kit in a waterproof container in the backyard, away from any large structures. Then, if their house collapses and they survive, their supplies will still be accessible. There are other advance preparations that you should take with your family that will help minimize the danger and prevent confusion. Decide where your family will meet after the earthquake. Discuss alternative routes. Make sure everyone has each other's cell phone numbers. Also, make sure that everyone has the phone number of a relative in another city. Then, if you are at home, your spouse is at work, and your children are at school when an earthquake hits, and you can't reach each other, you can all call the out-of-town relative to let someone know you are all right. It will bring a lot of peace of mind if you are surrounded by chaos. In addition, give this relative some of your vital information, such as health insurance information, in case you are not able to access yours. Other preparations you can take include making certain that your home is as earthquake proof as possible. Put straps on the hot water heater. Secure tall, heavy furniture such as armoires and bookcases to the wall. Be certain that hazardous materials, such as gasoline, are stored securely in the garage. Do not hang large sculptures or other heavy objects over beds and sofas in your home. Know how to turn off the gas and water to your home. Teach your children to avoid downed power lines. If you are afraid of running out of water before emergency help arrives, think about sources of water in your home. You could drain water from the hot water heater, melt ice left in the refrigerator, or drink the liquid from the canned vegetables. You should be able to find enough to survive for a few days. Simply throw in a change of clothes and some medical supplies, and you'll be ready to take care of your family in a natural disaster. Thank you. These are important reminders. I imagine people in other parts of the country where earthquakes aren't common, tend to gloss over the threat in their area. But the irregular patterns lately are an indicator than an earthquake could happen anywhere and we should all be ready. This is good information for everyone to know. Just recently, Mineral, VA was the epicenter of an earthquake that spread up and down the East Coast. The residents in the area are still trying to fix the damage. This was the largest earthquake in our area for many years. And, this area is still receiving aftershocks - in fact, we just experienced one this past weekend. Excellent information Deb! Having a destination to meet with family, and alternate routes to get to that destination after an earthquake is extremely important! With the Great American Shake-up happening tomorrow, this is a timely reminder for people to take steps to prepare for the next earthquake in their area! Very timely, my friend in Sacramento just said she slept through an earthquake earlier this morning! Had the Japanese arranged for all the preparations that are specified in this article, they would've survived the recent earthquake to a great extent. Superb informative piece! Everyone owes it to their families to take a few basic steps to be prepared for whatever type of disaster could occur in their area ... whether that may be earthquakes, floods, tornadoes or hurricanes.